A mock-up of a Bell V-280 displayed at HeliExpo 2016 in Louisville, Kentucky. Credit: Chris.w.braun. The V-280 Valor tiltrotor aircraft being developed by Bell has achieved a milestone by reaching the optimal cruise speed of 280k true airspeed. The flight test was carried out by Bell and Team Valor at the company’s Flight Research Center in Arlington, Texas, US. 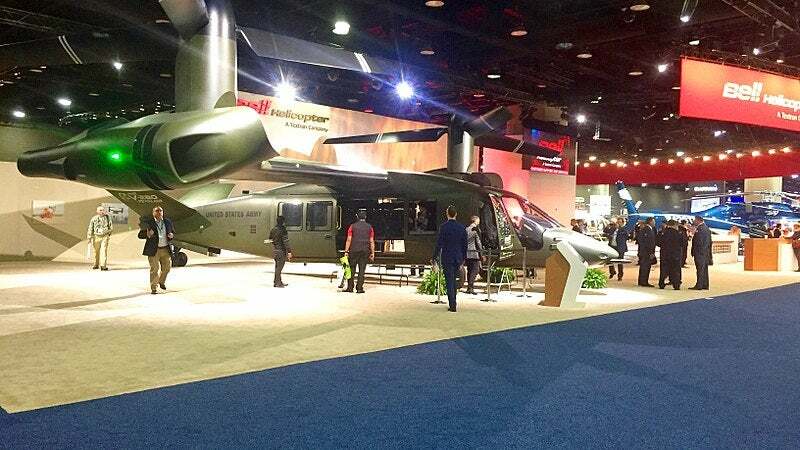 The US Army selected the third-generation Bell V-280 Valor tilt-rotor design for the Joint Multi-Role (JMR) technology demonstrator (TD) programme, which is the precursor to the US Department of Defense’s Future Vertical Lift (FVL) programme. The aircraft was classified as a Category I proposal by the army evaluation team. It has completed a full year testing and logged in more than 85 hours of flight time to date. Bell advanced vertical lift systems vice-president Keith Flail said: “It is a remarkable achievement to hit this airspeed for the V-280 Valor in just over a year of flight testing. Bell and Team Valor will now focus on further expanding the aircraft’s performance focusing on low-speed agility manoeuvres, angles of bank, and autonomous flight. The army’s FVL programme seeks to replace between 2,000 and 4,000 medium-class utility and attack helicopters. Last month, Lockheed Martin company Sikorsky and Boeing revealed their SB>1 DEFIANT helicopter that was also selected for the JMR TD programme.